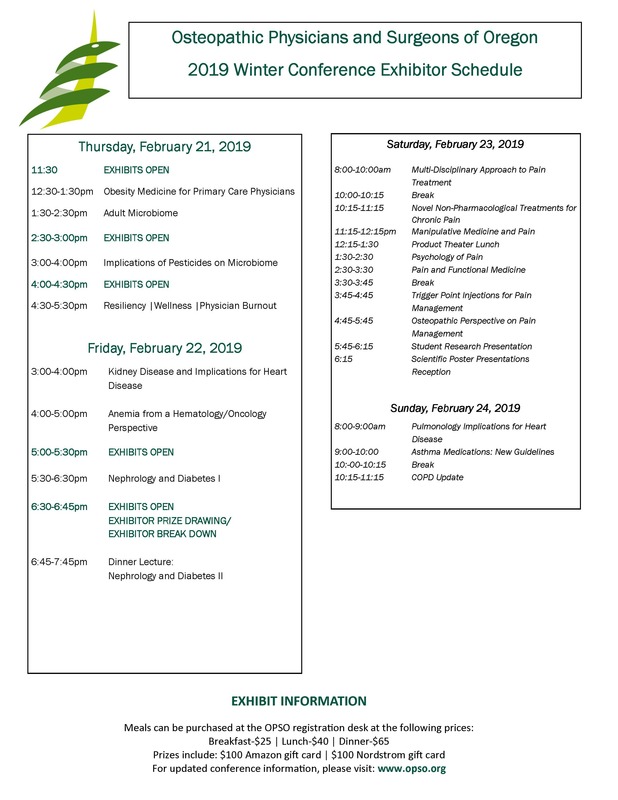 This CME conference provides exhibitors with a unique opportunity to meet with and educate physicians on all aspects of their products and services. Exhibits open at 11:30 am on Thursday, February 21st. Exhibits close and break down at 6:45 pm on Friday, February 22nd, following the exhibitor prize drawing. MEALS: Due to increased venue costs, OPSO can no longer provide exhibitor meals. If representatives would like to purchase meal tickets, please indicate the type and quantity on the registration. Thank you for your understanding. Gold Exhibit: $2,000 Includes everything in standard exhibit package plus premium placement in the Exhibit Hall and logo placement in program materials with a link of your choice. Gold exhibitors will be located in an exclusive entry room where meals & breaks occur, making the location a true premium • Exhibit space is assigned on a first-come, first-serve basis, space is limited. · The option to display a booth on the mezzanine during the duration of the conference at no additional cost.